In Part 1 of our exploration of the different types of quartz gem, we talked about several different types of quartz, including macrocrystalline varieties such as amethyst, ametrine, aventurine, blue quartz, citrine, eisenkiesel, milky quartz, and pink quartz. This time around, we’re looking at the following types of quartz: prase, prasiolite, rose quartz, smoky quartz, hawk’s eye, tiger’s eye, and herkimer diamond. Let’s get started! Prase is a form of Quartz that comes in varying shades of green. This mineral gets its color from thousands of inclusions within the stone. The inclusions that blemish Prase stunt the growth of the Quartz causing uncut forms of Prase to come in an extensive variety of shapes and sizes. 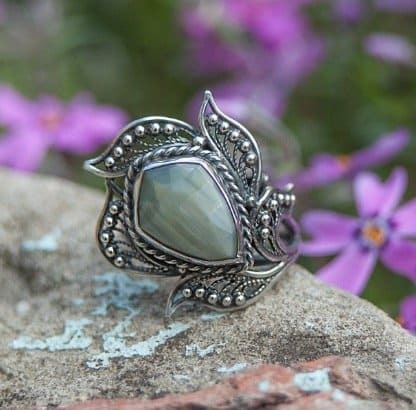 Though Prase is used in statement jewelry, more stable forms of Quartz, such as Aventurine, are the go-to for jewelry that receives daily wear, such as engagement or wedding bands. Pradoilite, which also goes by Green Quartz or Vermarine, is a green form of Quartz that is extremely rare to find in nature. 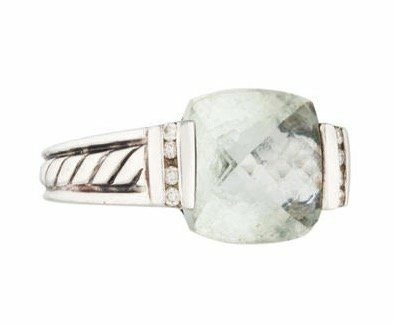 Due to this rarity, most Prasiolite stones that are sold in jewelry are actually a result of treating Amethyst through irradiation or heat. Though larger cuts of Prasiolite exhibit pastel shades of green, the smaller cuts allow for less saturation and appear nearly colorless. Prasiolite, though rare, isn’t a very popular form of Quartz among gem collectors and can be acquired at relatively low costs. This form of Quartz is a great option for brides and grooms looking to stretch a buck while still donning a beautifully delicate stone. Rose Quartz is an impressively delicate form of Quartz that comes in various shades of pink. Larger cuts of Rose Quartz exhibit more intense hues while smaller cuts are less saturated with this stones stunning shade. Rose Quartz is also known for its inclusions forming popular shapes, one of which being a star that is similar to the shape of an asterix. 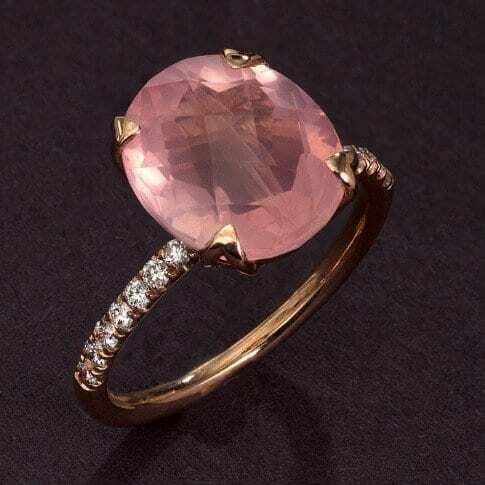 Rose Quartz is typically translucent but many cuts have a cloudy appearance that transcends throughout the ring, and unlike Pink Quartz, Rose Quartz is not sensitive to light and will not lose its coloring with exposure to it. This ring is perfect for a bride or groom looking for a unique yet delicate stone for their wedding or engagement ring, as well as for a bride or groom celebrating their fifth wedding anniversary as Rose Quartz is the stone that is traditionally used to commemorate this meaningful milestone. 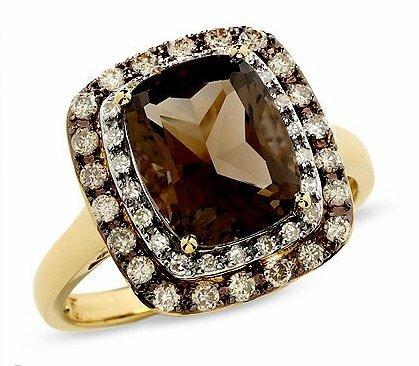 Smoky Quartz is a great form of Quartz for those seeking a brooding and mysterious addition to their special piece of jewelry. 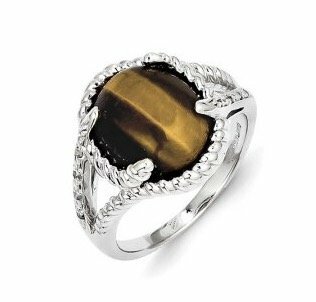 Smoky Quartz gets its varying degrees of color from its internal presences of aluminum – an addition that sometimes allows for an attractive yellow undertone. This beautiful stone varies in color from dark grey to nearly black. Smoky Quartz offers variety in transparency also, coming in forms that are completely transparent or completely opaque. Like all Quartz, smokey Quartz is durable and perfect for individuals looking for a darker colored stone to add to their engagement or wedding band. Hawk’s Eye Quartz, also sometimes called Falcons Eye, is a form of Quartz that has numerous coloring that range from blue-grey to blue-green. 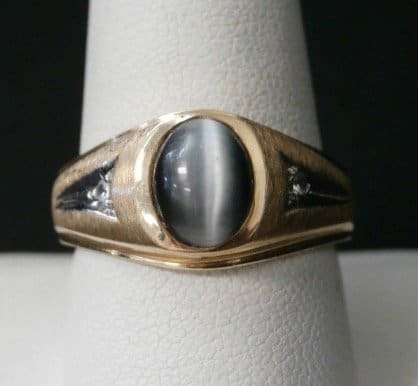 What makes this stone remarkable is the light it reflects and they optical illusion of a hawk’s eye that it creates! This is an extremely unique stone that, like most other Quartz, is impressively durable. Hawk’s Eye Quartz are between a 6.5 and 7 on the Mohs Hardness Scale and make a great addition to one’s jewelry collection – especially wedding and engagement rings! Tigers Eye is the evolved form of Hawk’s Eye and is created when a Hawk’s Eye Quartz oxidized Iron and changes its coloring. Tigers eye possesses more brown shades than its predecessor, even offering golden undertones with hint of reds. Other than changes in color, Tigers Eye Quartz possesses the same alluring traits of Hawk’s Eye – specifically it’s beautiful optical illusions and it’s admirable hardness and durability. Yes, that says diamond. And yes, it’s a Quartz. Herkimer diamonds are extremely impressive varieties of Quartz. These stones are double terminated Quartz crystals, essentially meaning that in their natural state, they have points on each side. 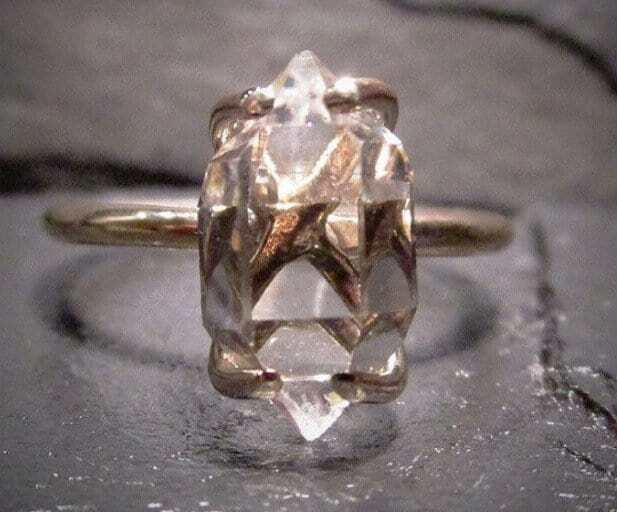 What allows Herkimer Diamonds to have points on each side is that, instead of growing off of the face of a rock like most Quartz do, Herkimer Diamonds form and grow while free floating in an air bubble within clay or larval – pretty neat, huh? Even neater is the beauty of this Quartz – it is colorless and can possess the clarity of water! Like all other Quartz, Herkimer Diamonds are also durable and make a perfect Quartz alternative to a couple looking for an impressive diamond alternative for their wedding or engagement ring! Macrocrystaline Quartz are the more popular form of Quartz for use of engagement or wedding rings as they are Quartz that are found as a solid rock. In the next section, we will explain cryptocrystalline quartz and microcrystalline Quartz, which also come in various shapes and sizes, but of which, fewer are usable for stones in wedding or engagement rings.